The FAR Academy Trust is a unique registered Charity supporting young people and the community. The FAR Academy Trust is the UK's first and only Skateboard Deck Building and Design school, using skateboarding as the channel to engage young people on to the positive pathway of learning, through personal achievement and alternative education. We provide a unique learning opportunity which has been tailored to suit young people who struggle to learn in mainstream education. Our emphasis is on creating a positive attachment to learning and to support our students to gain their qualifications. 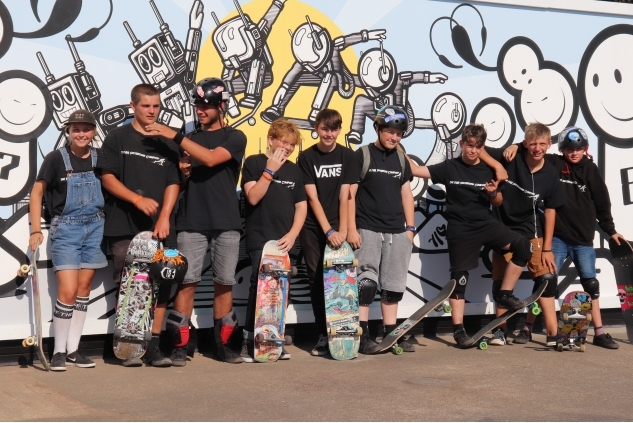 In addition to this The FAR Academy Trust and FAR Skate team runs a retail Charity Skate shop where young people can purchase any skate equipment they might need, all profits from the charity skate shop are used for supporting young people and the community. On Saturdays we also host a growing youth club and skateboarding lessons for new members from 10am and free open skate sessions 11am-2pm. There is a mini ramp on site and weather permitting we can use the mobile ramps outside. Our most positive success and impact has to be our students. Everyone is welcome at The FAR Academy, every week we have new young people who want to join, our students come in even when they are not due for lessons, and they are here every weekend. To achieve this level off attendance is in itself the grass roots of successful innovation and a positive sign that we are on the right track. The FAR Academy provides a supportive safe space where young people can feel valued and inspired to thrive. pays for art equipment stationary for a new student. Pays to register a student for Maths and English qualifications. Pays for a complete skateboard making kit.